“In The Practice, you will learn that a wellspring of inner peace and happiness exists inside each one of us, and is easily accessible with simple techniques that require only minutes a day." Barb Schmidt believes that making subtle shifts in the day will improve inner happiness, creating a positive ripple effect on all areas of life.In her new book, THE PRACTICE (HCI Books), Barb has structured an easy-to-implement, three-part daily routine- Waking Up, Living Present, Letting Go-that will help you look inward, cultivating the beautiful qualities of acceptance, gratitude, patience, compassion, strength, and courage. Barb provides readers with a set of practical tools that can be used throughout the day to help cultivate a peaceful mind so that readers can live their best lives filled with happiness, love, mindfulness, and purpose - the magnificent life that we are all meant to live. 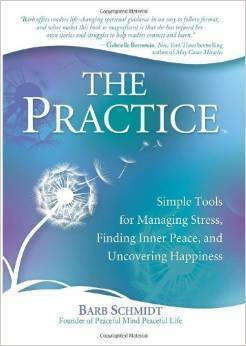 THE PRACTICE is a set of practical tools that can be used throughout the day to guide us along life’s path. It is a compilation of the great Truths taught by authentic teachers and masters throughout the centuries from various religious and spiritual traditions. It is for people who are looking to deepen their connection to their innermost selves.Barb has garnered followers from across the globe through her charismatic and radiant personality driven by the quest to find happiness and peace. THE PRACTICE begins with Barb’s own personal path of self-discovery, which began as a part of her recovery from her personal battle with bulimia. Throughout THE PRACTICE, Barb shares with readers the timeless truths and wisdoms she has learned through her nearly thirty years of study and practice with many of the modern-day masters. Each chapter concludes with “Parting Seeds” – key takeaway points discussed in the chapter to keep in mind as you go about your day. Barb Schmidt is such a captivating speaker that her passion and charisma have garnered her the devotion of fans, who travel across the globe to be part of her inspiring movement for global peace through inner peace. Barb is founder of Peaceful Mind Peaceful World, a community outreach program through Florida Atlantic University (FAU) designed to promote dialogue in the greater community on the topic of inner peace by incorporating workshops and weekly teachings with Barb and many of her esteemed mentors, including His Holiness the Dalai Lama, Dr. Jane Goodall, Dr. Andrew Weil, and many others. 2. How did The Practice/A Path help you overcome your greatest challenge? When I started a path of self-discovery, and deep connection with God, little by little in meditation I started to get to know me - all of the good and all of the not so good things that happened in my life. I believe that my spiritual path has helped me accept me, all of me, and has helped me feel complete; helped me be open and receptive to life; vulnerable. Through this acceptance of my life I have overcome my fear of not being good enough, not being lovable, not feeling complete or whole. 3. What prompted you to found The Practice? 5. What would you want people to remember about you? 7. What was your inspiration in writing this book? 8. There are so many self- help books out there what makes yours stand out? 9. What is your mission for PMPL? Peaceful Mind Peaceful Life is a movement to peace, and wholeness. It’s a vision I have of changing the world through inner peace. The Practice is a path; method for living a self-empowered life, managing the stresses of life, and uncovering the happiness and greatness that we all have within. We have become such an external society of beings and we must start living our lives from “the inside out”. We cannot live the life we wish to live at the mercy of the external world. When we take the time to go within each day, ground ourselves, we can take on the challenges of the world; our lives with strength, security and patience. Having patience, managing our stress, living with peace and love is changing the world; fulfilling the mission of Peaceful Mind Peaceful Life. I love to read, spend time with friends and family, walk and play with my dog Ellie, yoga, pilates, walking, skiing, watch football and basketball. 13. What spiritual teacher has influenced you the most? 14. How do you think the stigma of meditation has changed over the years? 15. What is one simple thing everyone can adapt into his or her lives? My thoughts: 'THE PRACTICE: Simple Tools for Managing Stress, Finding Inner Peace and Uncovering Happiness' is an easy to read and insightful book that has helped me to learn coping mechanisms. I have learned to look beyond the moment and to focus on helping others as a way to alleviate the stress in my own life. Barb has many life enhancing tips that really help you to understand your purpose and to not feel alone in dealing with the things that get us down. This book can help a person to get through the otherwise stressful holiday season by focusing on the things that really matter and letting other 'stuff' slide. I do crafts to relieve stress. I relieve stress by talking a long walk followed by a hot shower.